After spending several weeks listening to Pain is Beauty by Chelsea Wolfe, I was really anticipating an incredible show on Friday. Her voice and her continual growth led to a rather full crowd of eager lookie-loos yearning to hear her dark take on pop music. She was joined by Dallas act True Widow who aimed to set off the night in the right way. Read on for thoughts, and thanks to our friend Bryan at PopPress for sharing some photos with us. 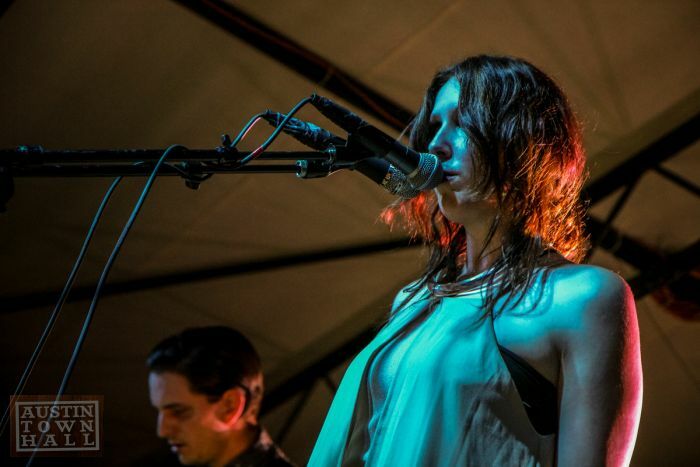 It’s been a busy three years for Chelsea Wolfe, pushing out four albums of quietly acclaimed music. Her early works were gentle, though you could sense a bit of brooding beneath what she was releasing. Now, with Pain Is Beauty, there’s more force to her music, more emphasis; she’s managing to balance her angelic voice with the dark emotional content that’s been there all along. Finally, this feels like what Chelsea wants us to hear. After listening to the folkier approach of Unknown Rooms…Chelsea Wolfe makes an immediate statement with “Feral Love.” It’s got a pulsating drum loop that is made more emphatic by scratching beneath the surface and punctuated noise. Her voice sits perfectly in the mix, but the accent of the backing female vocal only strengthens the tune before it fades out. Yet, immediately the ante is upped with “Hit a Wall.” There’s a driving beauty hidden in the instrumentation, but while there’s an obvious darkness, Wolfe’s angelic voice serves as the perfect foil. While I find that the first few tracks are quite forceful, there’s also a playful element to Pain Is Beauty. “The Warden” is about as pop-centric as I think Chelsea would go; the beat beneath this song is about as light as you’ll find in her work, allowing her voice to shine as the glorious instrument that it is. Smartly, Wolfe juxtaposes this stellar song by placing it next to “Destruction Makes the World Burn.” The guitar steals the show on this one, leaving listeners with a tune that closely resembles contemporaries like Vivian Girls, had they only grown up transfixed by metal. For me, I find that Chelsea Wolfe has a striking ability that few have managed in recent years; she is able to keep my attention, despite songs that tinker beyond the 8 minute mark. Her opus, “The Waves Have Come” is built upon a piano backbone, and like the system of tides, there are varying ebbs and flows within the tune. The music rises and falls, quiets then joyfully explodes. It’s possibly the perfect statement track for this record, as the instrumentation, and the careful touches of emphasis, are so incredible that it leaves no doubt about how much care went into each and every detail within. It’s not just this song, though it is quite obvious here, but the whole record. That says a lot considering this is her fourth album in as many years. 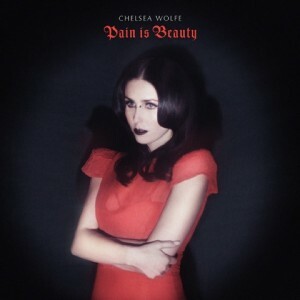 Pain Is Beauty is finally the statement album that you could feel Chelsea Wolfe building towards. Every detail is attended to on the record, yet it doesn’t lose the intimacy of her vocals. The dark tint that often coats her work remains, but the curtains have been drawn back even more, letting us all see the magnificent talent that she has become. 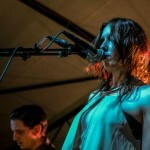 Chelsea Wolfe is an artist who has always earned positive press and muchos de praise around these offices. With that said, you can imagine that we were excited today to receive a new song from her called “The Waves Have Come”. The song starts out fairly slow, and some may write it off, but wait around until about the 2 minute mark when this baby really takes off. At that point, some nice drums kick in to take us towards an incredible rising action that somehow never comes down for me until the track wraps up after 8 beautiful minutes. New album Pain is Beauty is due out September 3rd on Sargent House.